Both companies are down over 50% in the last year. Both have exciting CAR-T therapies in development. Only one deserves consideration for your portfolio. Immunotherapy, or using the body's immune system to fight diseases and cancers, has become a sizzling investment opportunity for biopharma companies and investors alike. While there's been interest in everything from DNA vaccines to checkpoint antibodies, the real frenzy has surrounded CAR-T therapies, in which a patient's immune cells are engineered and reinjected as a personalized treatment. One darling of the CAR-T boom has been Juno Therapeutics (NASDAQ:JUNO), which will be among the first companies to submit an application to the U.S. Food and Drug Administration for approval. Investors are widely expecting it will be one of the first to successfully gain approval, too, with speculative launch dates in the first half of 2018. And although it hasn't been as closely associated with CAR-T as Juno Therapeutics, Ziopharm Oncology (NASDAQ:ZIOP) is part of a collection of entities (including Intrexon, Merck, and MD Anderson) developing a therapeutic pipeline in the same class, in addition to programs for various other indications. The company was a little late to the party, but its investors are excited about the potential in immunotherapy all the same. Both companies are down 50% in the last year. Both are pusuring CAR-T immunotherapies. Those similarities make for a fun question: Which company is the better buy, Ziopharm Oncoloy or Juno Therapeutics? As it turns out, the two are actually quite different -- and only one deserves consideration for your portfolio. Let's begin with a head-to-head immunotherapy comparison. Juno Therapeutics has an astounding 10 clinical trials in its pipeline -- all of which use CAR-T. Eight have initiated at least phase 1 trials, while two are making headway in phase 2 trials. The most advanced program, in acute lymphoblastic leukemia (ALL), posted a complete remission rate of 89% in its phase 1 trial. Data like that are what have investors so excited about the stock's potential. On the other hand, Ziopharm lists eight clinical trial categories on its website for CAR-T therapeutics, but has only begun enrolling patients in two phase 1 trials for advanced lymphoid malignancies, including ALL. That means it doesn't (yet) have the same data as Juno Therapeutics. The difference in pipeline maturity can be chalked up to the fact that Ziopharm was relatively late to the party: it's developing a technology licensed from MD Anderson in early 2015. That makes it highly unlikely the company will be first to market with a CAR-T therapeutic if approval comes its way, which could severely limit its future market potential considering the torrid pace of Juno Therapeutics and Kite Pharma in the same indications. Data sources: Press releases and Google Finance. Revenue may be the least important metric for either development-stage company, but it highlights major differences in the commitment levels of partners. So does each company's cash balance. 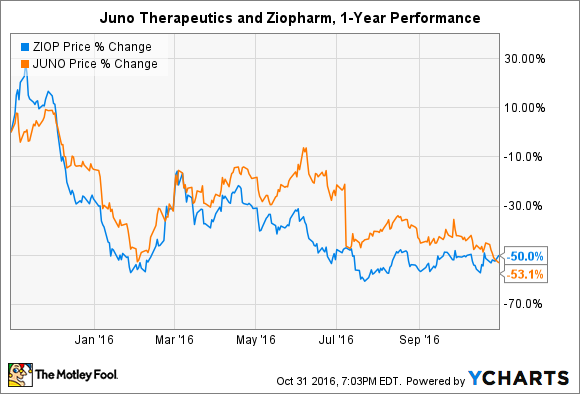 Juno Therapeutics has significantly more cash padding its research and development efforts than Ziopharm. The bulk of the company's total came in summer 2015 from a $1 billion investment from Celgene, which included the purchase of 9.1 million shares of common stock and jump-started a collaboration. Ziopharm touts a partnership with Merck Serono, but it's not even close to being on the same level as Celgene. Merck Serono's partnership allows it to select two CAR-T targets, sit back as Ziopharm and Intrexon take care of all development expenses, and then take the goods and run if they reach investigational new drug status. In other words, Ziopharm doesn't benefit from the partnership in a meaningful way. Now, investors may point out that Ziopharm is pursuing programs outside of CAR-T, but none provide a strong case for investment. The company is partnered with or dependent on technologies licensed from Intrexon for every single clinical trial. Literally every technology (there are seven) used in a clinical trial on Ziopharm's website has been licensed from Intrexon. Worse, the pair have discontinued at least one clinical trial for a lack of efficacy and have struggled to show safety or efficacy in all others developed to a point they merit public reporting. It appears the company has a data problem. On the surface, the similarities between Juno Therapeutics and Ziopharm may make it appear as if the head-to-head matchup is close for individual investors. However, after a little more investigation, it becomes clear that the better buy is Juno Therapeutics. The company has more and better data, a boatload of cash to fund development and commercialization, and serious partners willing to throw down serious capital. There are still questions investors need to consider -- will regulatory approvals from phase 2 results face unexpected obstacles in later-stage trials? Will CAR-T prove to be too toxic to be safe? -- but this particular matchup isn't even close.